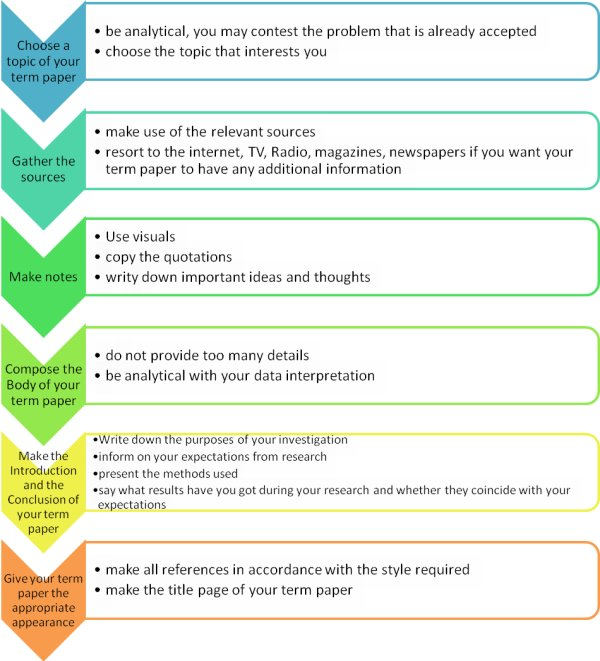 There are several steps to be followed in order to write a term paper. The following points describes the ways in order to write a term paper. Starting with the term paper- in order to start writing a term paper, the first and foremost thing that is to be done is go with the instructions. The students must do justice to the topic that is given in order to score good marks. The instructor must be consulted in case a doubt arises. Another thing that needs adequate attention is finishing the term paper on time and for that allot time for each of the activity starting from preparing, thinking and jotting down the points. Choosing a suitable topic for the term paper- A topic that is interesting to the student must be chosen. There are certain points that need to be taken care of while choosing a topic. Length- the length of the paper must be appropriate. This means that a topic that is not much wide, must be chosen instead of making a huge subject sketchy. Resources used in a research- Library is considered as a valuable source of information. It is to be kept in mind that the topic chosen has a variety of information that may be collected during the implementation part. Tools- there must be availability of correct statistical tools. Going with the research- For obtaining a successful term paper, the student is supposed to research on the topic that is chosen. The library for example is a good source. There are several strategies adopted while doing the research. The first thing is reading some contents that are related to the subject chosen. The second thing is referring to books and journals. The next step is finding out materials that are relevant and thereby making a photocopy of that. Resources for the research- In order to prepare a term paper, the student can go through reference works, journals, books, newspapers and publications of the government. Paper organization- A number of issues that are related to organization can be considered. They are outline, method and sections or parts. Paper writing- The paper writing must be successful in communicating the idea that is applied through giving effort, keeping in mind the style that is to be followed and the technical part. References- In order to write a report, the research works of others must be consulted. As a result, the references must be jotted down while conducting the term paper. Paper presentation- The paper is finally presented through printouts with page numbers, spacing and suitable fonts. Term paper writing Assignment Help/ Term paper writing Homework Help is available at our services in 2 simple steps. 1. Submit Term paper writing Assignment / Term paper writing Homework / Term paper writing Project requirements below .